The poor racing conditions which plagued yesterday’s Invitation Race on Sydney Harbour were little better today as the fleet lined up for Race 1 of the Giltinan Championship. While the racing was unbearably slow due to the lack of wind, the result was terrific for anybody who likes to see the underdog defeat the champs. Marcus Ashley-Jones, Stewart Wells and Bert Schandevyl, all having their first season in 18ft skiffs, stunned the crowd when they took the honours in Club Marine after leading around every mark. For each of the trio, it was their first 18 Footer win. The final winning margin was 2m15s from Michael Coxon, Aaron Links and Trent Barnabas in Thurlow Fisher Lawyers, with Seve Jarvin, Sam Newton and Tom Clout third, a further 3m21s back in Gotta Love It 7. With the easterly breeze never getting above five knots the race took 2h12m11s to sail and the fleet were left to complete the course in near darkness. 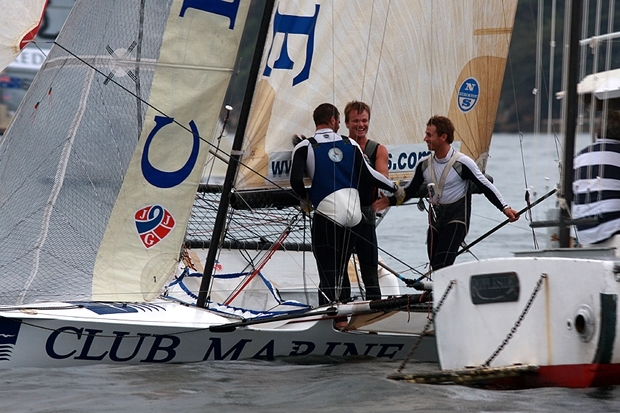 Club Marine took the wind on the first windward leg of the course from Robertson Point to Rose Bay, where they held a lead of 45s over New Zealand’s Scott Kennedy in Yamaha. Gotta Love It 7 was a further 15s back, followed by Thurlow Fisher Lawyers, appliancesonline.com.au (John Winning Jr), Yandoo (John Winning), Gill (Dave Alexander), Fisher & Paykel (Trevor Barnabas) and Coldwell Banker New Homes (Mark Kennedy). Former champions John Harris (Rag & Famish Hotel) and Rob Greenhalgh (Benny/PSP Aust-Asia) were back in 13th and 14th places respectively. Ashley-Jones extended Club Marine’s lead to 2m15s at the end of the spinnaker run to Kurraba Point where Gotta Love It 7 had moved into second place ahead of Yamaha and Thurlow Fisher Lawyers. Gotta Love It 7 lost out when Jarvin sailed to the RHS of the course, while Yamaha and Thurlow Fisher Lawyers went left. When they met, Thurlow was just ahead of 7 and Coxon immediately tacked to cover his arch rival. It was obvious that Coxon was prepared to cover Jarvin rather than chase the leader at that stage. As the conditions became even lighter over the latter half of the course, Ashley-Jones and his crew sailed beautifully to cover every move put on them by the chasers. Michael Coxon’s experience gave him a hard fought second placing ahead of Seve Jarvin, who managed to relegate Scott Kennedy’s young kiwi crew back to fourth place over the last 100 metres of the course. Race 2 of the championship will be sailed tomorrow (14 February) with the midweek races on Tuesday, Wednesday and Thursday. Click on the images below to enlarge. You can then use the left-right keys on your computer to scroll through them.